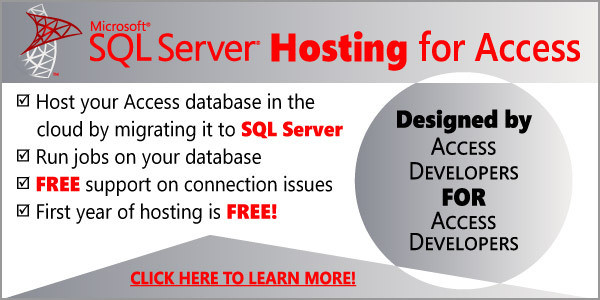 Thinking about hosting your SQL Server database on the web? Hosting on the web is a hit or miss, you will find a wide range of providers, from dirt cheap hosting companies that will lump you in with hundreds of other databases, to premier firms that will rent you a server all for your self. If you’re not careful you may end up with a host of problems: Record locks preventing users from committing changes, speed issues, bottlenecks, and records you can’t edit, etc. We love the combination of SQL Server and Microsoft Access, it is an unbeatable combo, and if you need it to work on the web then you can’t go wrong with hosting your SQL Server database in the cloud, it’s fast, reliable and secure. If done right it may even be faster using the cloud than using a Access backend! Given that most Access + SQL solutions are relatively small databases, you want to host your data with a reliable provider and someone who can provide you with specialized support to get your app on the web. Best of all: Personalized coaching to get your database on the web! Get one on one coaching every step of the way as you design, test, and deploy your database to the web, no other hosting firm offers more. All of this for just $39 per month! And if you prepay for one year you willget one month free. FREE live tech support: we will assist you in trouble shooting connections between Access and your SQL database. Don’t fret on why your database is not connecting to the server, a solution is just one phone call away. Ready to get started? Give us a ring at 844-328-2636 or contact us here.